Regulatory failings from money laundering is a situation several global banks have been apart of, and even paid $321 billion in fines since 2008 for to market manipulation and terrorist financing, according to data from Boston Consulting Group. That tally of money laundering is set to increase in the coming years as European and Asian regulators catch up with their more aggressive U.S. peers, who have levied the majority of charges to date, BCG said in its seventh annual study of the industry published Thursday. 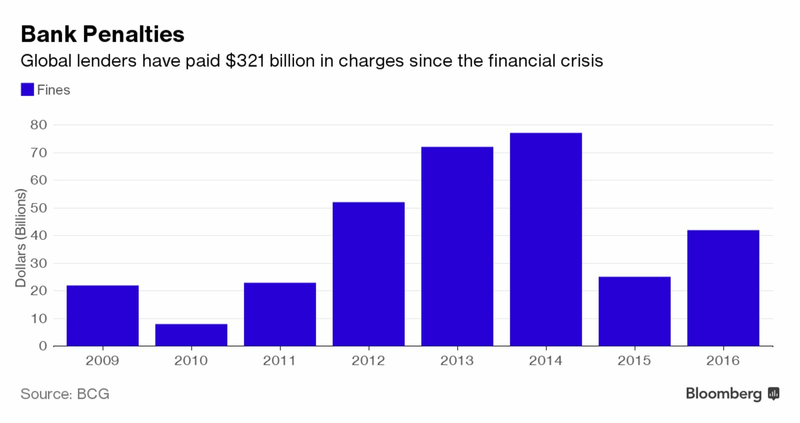 Banks paid $42 billion in fines in 2016 alone, a 68 percent rise on the previous year, the data showed. The era of ever-increasing regulatory requirements is here to stay, BCG said, despite President Donald Trump’s pledge to roll back the 2010 Dodd-Frank Act that reshaped U.S. banking in the aftermath of the collapse of Lehman Brothers Holdings Inc. The number of rule changes that banks must track on a daily basis has tripled since 2011, to an average of 200 revisions a day, according to the report. Almost 10 years after the onset of the financial crisis, the banking industry still hasn’t completely recovered from the losses it suffered by one measure, BCG said. While finance firms created so-called economic profit of 159 billion euros ($167 billion) in 2015, a fifth annual increase, the industry remains 9 billion euros in the red on a cumulative basis for the years 2009 to 2015, the data show. BCG calculated economic profit by taking a bank’s operating results and incorporating its cost of capital. European lenders haven’t posted an annual economic profit during that time, while U.S. firms have been in the black for the last three years. Banks in Asia-Pacific, South America and the Middle East and Africa have posted an economic profit every year. Original article published on www.bloomberg.com.